How do I upload my MMD Video in 1080p HD? How do you make HD Videos in MikuMikuDance? Can you make a MMD Video in 1080p HD? 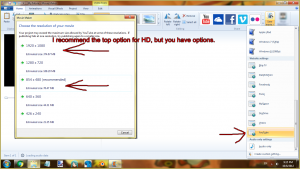 Use Windows Live Movie Maker to Render your MMD Video in 1080p HD! Sometimes when rendering in MMD you can get really low quality videos, or really large files that are hard to upload to the Internet. I am going to show you how to render an MMD Video in 1080p HD and still upload in a reasonable amount of time. Once you have your video done in MMD and you’re ready to share it with the world, go ahead and click file>Render to AVI file. A little Windows browser will pop up. Give your movie a name, and click “save”. Remember where you saved it. A box should come up with some options. Make sure the frames are the same as under the play button, if it’s highlighted make sure “export wav” is checked, and click “Cinepak Codec by Radius”, then OK. You will see your video playing frame-by-frame, and once it’s finished MMD will open again. Close MMD. If you wish to upload it somewhere else you can click the “Save Movie” button, and scroll down until you see “Youtube”. What? you didn’t want to upload to Youtube? Don’t worry! You’re not. This just saves as a video file on your computer that is common across the Internet. the format is “MP4” and it’s great for HD videos. Enjoy your 1080p HD videos as much as I do! ^^ Ciao! Hi! 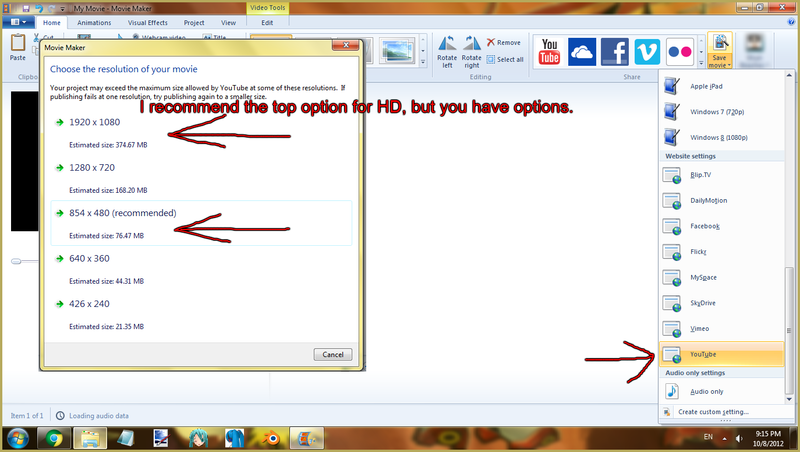 I’m trying to upload a HD video, but when I go to click “Cinepak Codec by Radius” I don’t have it. How can I obtain it? You don’t have the codec pack? When my animation is recording the quality looks fine.But after viewing the finished video, it plays in really bad quality and pixelated? I’ve tried this before and the result was fine in a 6 seconds video, 1080p but it won’t work for a longer video. The codec I used is Cinepak! Use “View->screen size” to set up the resolution. It *won’t* actually affect viewport’s size (only aspect ratio) during preview, but it will be what the renderer accepts. When I try to render on MMD, with “Cinepak Codec by Radius” it just crashes right after I hit “OK,” and with anything else, it just tells me that there isn’t anything to render. I’ve tried three times to render it, but nothing works. I tried yet again, and all it rendered was 7 seconds of pitch black and no sound. Have you tried different codecs? Try to render just a couple of seconds with every codec you have and see which ones work for you, which ones don’t, and which ones produce sufficient quality. Doing 1080p HD videos is nice, but if you’re new to this, it may be better to start with something you can assuredly make work… and 720p is quite a decent resolution, if you don’t plan to watch your videos on 65″ wall panels. You may install K-lite codec pack to get a wider selection of codecs. I have an issue, since i do not have the Cinepak codec by Radius, i use MPJPEG to render my stuff. It didn’t have maximun quality, but it was almost perfect. The problem is that recently, i downloaded NC+2 shader, wich make my project look really great, i mixed it with SSAO. Everything was fine, even the video when it was rendering looked like it was working, but the exported video had the issue that in some parts froze or didn’t played the audio during a certain period of time, and sometimes both. However, this only happened when i exported it with the WAVE file, when i tried to export it without it, it looked just fine. Well, I can’t help you with your current codec (except an advice to install more of them and see if any works as well or better for you without causing problems), but there’s a way to circumvent your issue. If exporting without WAV works for you, you can just do so and then attach the audio file with Avidemux or other similar software. How do I fix this…. Hey i was wondering how i could switch to using movie maker and not media player. Also, i have an issue with my mmd…whenever i try and render my stuff it looks like its rendering perfectly but with a tad bit of lag…when i open it to test play it,it will only play a few moments of it and skip most audio or play audio with no motion….i checked my media player and updated it hoping that was the issue but it wasn’t…i was hoping u could help since no one else could… i rlly want to get back to making my vids for youtube…i feel bad i cannot with this happening… i have 107 subscribers and i just started….i rlly dont wanna let the down…. Hmm I have been running into this as well. I need to do some digging, but it seems MMD is doing it. not your media player or editing software. It seems to be MMD or your encoder. Doing some experiments here to try and fix it. Ok I have been searching to resolve the problem, What codec are you using? If it is Ut Video there may be a problem where it sometimes does that. Try a different Codec and see if that works. What codec do you use? if you use RAW yes MMD crashes at 2700 frames, I tried it. All I can suggest is try another codec. Cinepack as described in this post renders slower than Ut Video for me. But see what works best for you!